BELL: 3rd 1,000/1,000 Running Back in NFL History? | "IT'S A STEELERS WORLD"! BELL: 3rd 1,000/1,000 Running Back in NFL History? Pittsburgh Steelers 2nd year running back, LeVeon Bell could be on pace to join the likes of Roger Craig and Marshall Faulkner as the third 1,000 yard rusher & receiver in NFL history. Bell added to what’s been a breakout second season in the NFL by passing the 1,000-yard mark on the ground during Sunday’s loss to New Orleans. The former Michigan State star entered Sunday 49 yards away from reaching the milestone and rushed for 95 yards and a score and added a career-high 159 receiving yards on eight catches against the Saints. 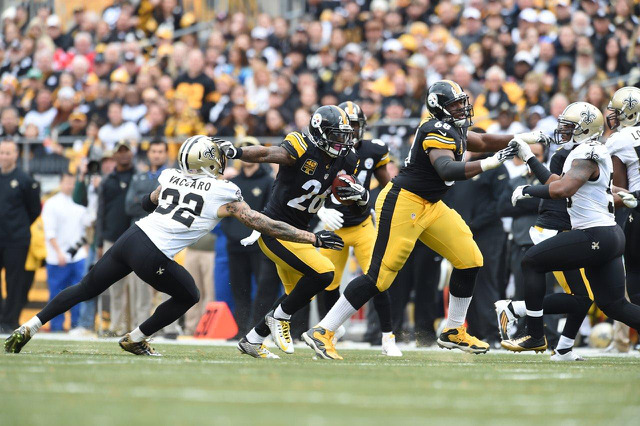 Bell was one of two AFC players to surpass 1,000 yards rushing Sunday and became the first Steelers back to accomplish the feat since Rashard Mendenhall in 2010. Bell leads the AFC with 1,046 yards rushing and has had more than 100 all-purpose yards in 10 of 12 games for the Steelers this season. His 254 all-purpose yards Sunday were a career high. With four games left in the regular season, Bell is just 357 receiving yards away from accomplishing this feat. But is that the main target on his mind? I highly doubt it. Just like the rest of the Steelers, Bell’s vision is focused on earning a playoff spot in the AFC, and hopefully beyond. Although the 1,000/1,000 statistic would be an impressive stat to uphold by any player, stats do not get you to the Super Bowl..”Wins Do”!